People have lots of reasons why they make the decisions they do – cost, location, past experience, word of mouth, convenience, just to name a few. When choosing a physical therapist, patients of course expect results, competence, convenient location and scheduling, affordability, and a likable treating physical therapist. The topic of things that matter to patients has even been highlighted in this blog. All of those are great things to keep in mind when choosing a physical therapist. However, one thing that our patients have told us consistently over the years is not often what is found in many physical therapy facilities, but rest assured, you get it here at SSOR – you stay with who you start with and you don’t get passed around between physical therapists. Think about why you like going to your favorite burger place, hairdresser/barber, or car mechanic – they know you, you know them, you like them, you trust them, and you get consistent results. Physical therapy is no different. The physical therapist you start with understands your history, why and how you got here, and what makes you tick. When you say your pain is a 6/10, they know what your “6” is better than another PT that hasn’t worked with you. You get comfortable with how they talk to you, their exercises, their hands-on techniques, and the rapport that you’ve developed with them. When some physical therapy clinics pass you around for whatever reason, it’s like starting all over each time. You have to tell them your whole story. Maybe their mannerisms are different. Maybe you just don’t “click” with them. Perhaps they told you something totally different than your initial physical therapist. Maybe their manual techniques are a little different (they may get the same results, but they’re still not the same!). Maybe you tell them that your pain is a 4/10 today but that might not mean a lot because your initial physical therapist knows that you started at a 6/10. Hopefully, you get the picture here. It is very important that you build a level of trust, rapport, and confidence in your physical therapist. 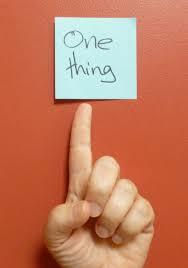 That’s why this “one thing” really matters to a majority of our patients. How do you know this is so important? We know this one thing is important for a number of reasons. First and foremost, patients tell us that’s why they like us or why they left “the other place.” We know this because if one of our physical therapists works at both locations, their patients follow them wherever they go. We know this because the cancellation rate spikes when a physical therapist is on vacation or out of town or patients just don’t schedule when “their PT” is out. We know this when they call back with a new PT problem and they only want “their PT” even if that PT isn’t immediately available to get them evaluated. We know this because they tell their friends that their guy/gal is the best and this is the only person to see. Finally, we learn this from our discharge surveys when patients tell us what they liked most about us – they stayed with who they started with. So, it’s pretty clear that this is hallmark of how we do things here at SSOR. We work very hard to make sure you “stay with who you start with.” Of course though, we have a plan in place just in case schedules don’t match, your PT is too busy at your requested time, or your PT is out of town on vacation for a week. In those instances, our physical therapists will introduce you to the “new” PT and give them the run down – why you’re visiting us, relevant history, your restrictions, what you like/don’t like, what the treatment plan is, and what to work on. Immediately, your confidence increases that this visit won’t be a waste of time and that your “new” PT knows everything they need to know to make sure you have a meaningful visit while “your” PT is out. If your PT is out for an extended time, like a full week for vacation, each PT writes out a brief summary for each patient that’ll be seen by other physical therapists. Nothing worse than opening a chart and seeing a treatment log for a patient you know nothing about and they know nothing about you. We not only care about our outcomes and our approach, but we also care about the “little things” that are “big things” to our patients. No question, the one thing that is non-negotiable to most patients is consistency. Patients deserve to have the person they are comfortable with – someone that knows them best, and vice versa. It would be a privilege to serve you and partner with you in your care. Give us a call! We’re confident you will be pleased.